The beauty of making pasta is that you can cut it into any shape you fancy. Use it to make the saffron and herb pappardelle, fill it with your own mixture of flavours or make sweet potato, lime and parma ham ravioli. Mix the two flours together and tip onto your work surface in a high mound. Make a well in the centre, plumbing down to the work surface for maximum depth and keeping the outer 'walls' of flour as high as possible. Break the eggs into the well and whisk together with a fork, then gradually draw in flour from the sides until the eggs have taken in all they can. Now go at it with your hands, working the flour and egg mixture into a soft but not sticky dough - you may need a little more flour. Knead the dough until it is smooth and even. Roll it into a ball, wrap in clingfilm and rest at room temperature for 20 minutes. Get out 3 trays (or large baking sheets) and line each one with a clean tea towel, dusted with flour. Unwrap the dough. It will feel soft, silky and settled. Divide into 6 if rolling by hand, or 8 if using a pasta machine. Wrap each piece individually in clingfilm. Take the first piece, flatten slightly and dust with flour. If using a pasta machine, follow the manufacturer's instructions, being sure to dust the pasta with flour (and shaking off the excess) between each rolling. I find that for most purposes it is enough to take the pasta down to the penultimate setting. 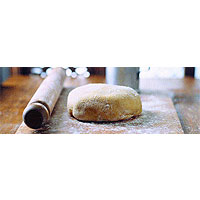 If you are rolling by hand, dust the work surface and rolling pin with flour, then roll the dough out as thinly as you can. Cut the pasta into shapes, then lay on the floured tea towels, dusting with more flour to prevent them sticking to one another. If not using immediately, leave out covered with more tea towels - fridge storage and clingfilm make for sticky dough. The dough can also be frozen.